Today’s kindergarten students will never know a world without AI, thanks to Apple’s Siri. 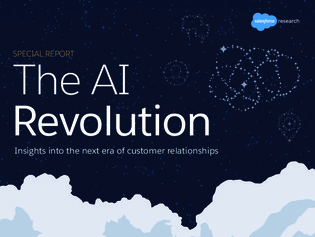 Salesforce Research compiled insights to see how much of a splash the AI movement is making on businesses and their customers. This report highlights key findings around customers’ heightened expectations for tailored, relevant experiences, and how businesses are using AI to meet them. Inside, you’ll also uncover the 3 big decisions companies look to leverage AI to help them compete in the Age of the Customer.